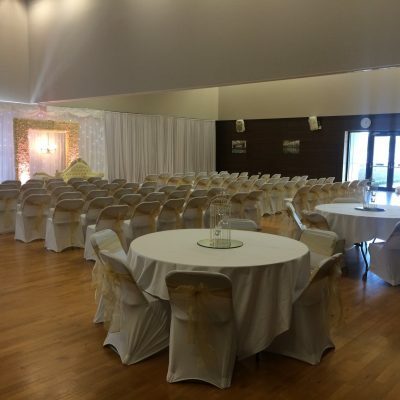 Whatever your events requirements, Rossmore Leisure Centre has the facilities and experience to accommodate all of your needs. Whether you’re celebrating, holding a sporting event, a corporate meeting, conference or team-building event, awards evenings and ceremonies, or even weddings, we’ve got everything you’ll need. Our main events space is a large and versatile Sports Hall that has space for 250 people, for which we can provide catering using our on-site facilities. You can also make use of our dedicated entrance, while we also boast parking space for up to 150 cars. Rossmore is located just to the north-west of Poole and to the north-east of Bournemouth, putting it in easy reach of these two major south-coast towns and is just a half hour walk, or 10 minute taxi-ride from Branksome railway station. This large and versatile space offers a great deal of flexibility for whatever sort of event you’d like to hold. With space for up to 250 people inside, it’s ideally suited for anything from sporting occasions to large parties. We also boast on-site catering facilities, to keep your guests well fed.